Philadelphia's Chemical Heritage Foundation maintains a wonderful Flickr page of images relating to the history of chemistry, pharmacy and alchemy. While perusing their image banks, I came across this collection of 17th and 18th-century paintings of alchemists practicing their occult art -- paintings which include some revealing glimpses into the private life of those who searched for the fabled lapis philosophorum. Credit for the images and quoted text below goes to the Chemical Heritage Foundation, "a non-profit library, museum, and center for scholars that's dedicated to the history of chemistry." Some of these images are very large - I highly encourage readers to click to see the fabulous details (I've picked out a few below). Alchemist. Thomas Wijck (Beverwijck 1616–1677 Haarlem), Holland, 17th Century, Oil on panel. 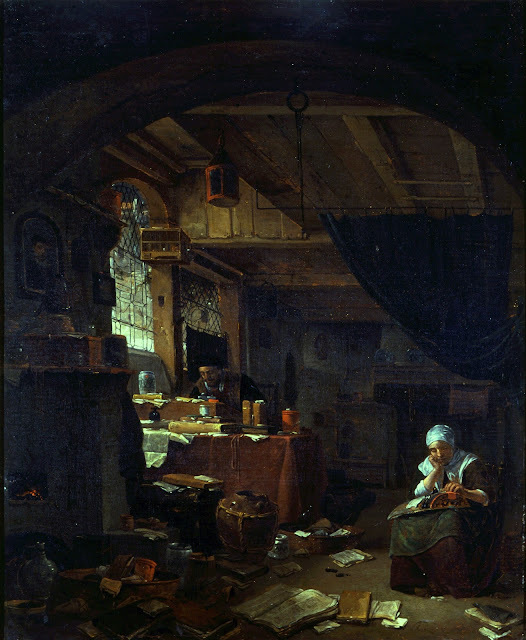 From the CHF: "A dark study illuminated by single leaded glass window at left; in middle ground a seated man behind cluttered desk faces slightly left; open and closed books, papers, jars and jugs scattered on floor; at right a seated woman in white cap, collar and cuff, bends over a lacemaker; at left a glowing furnace, above that on wall a portrait of a man." Fisher Collection; Gift of Fisher Scientific International. Photo by Will Brown. The Alchemist. Francois-Marius Granet. Oil on canvas, 18th century. A bit more spare on detail, but this painting captures the moody contemplation of early modern occultists very well, I think. Also a great use of shadow. 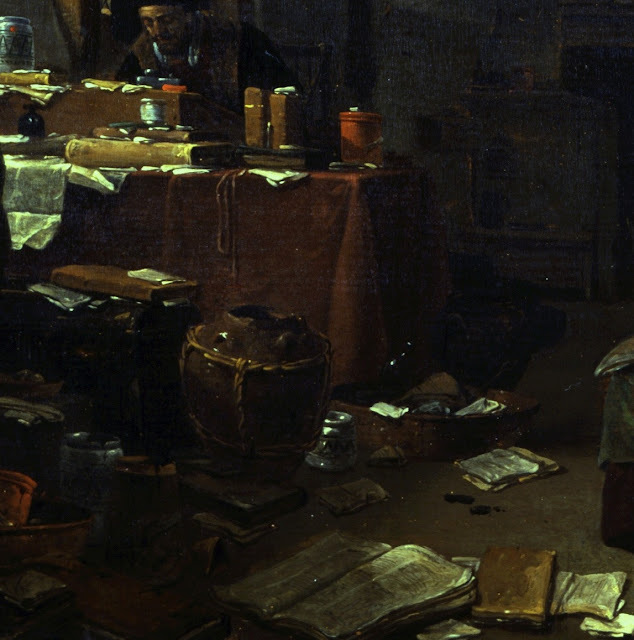 An Alchemist in His Study. Egbert van Heemskerk I. 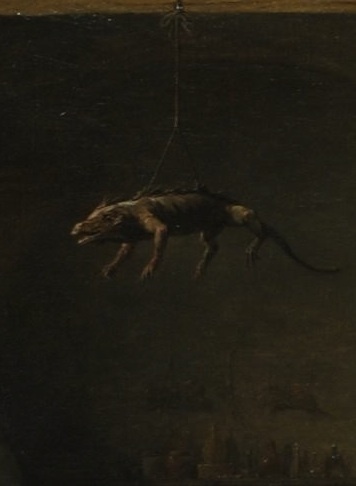 Oil on canvas, 17th century. Fisher Collection, CHF Collections. Photo by Will Brown. 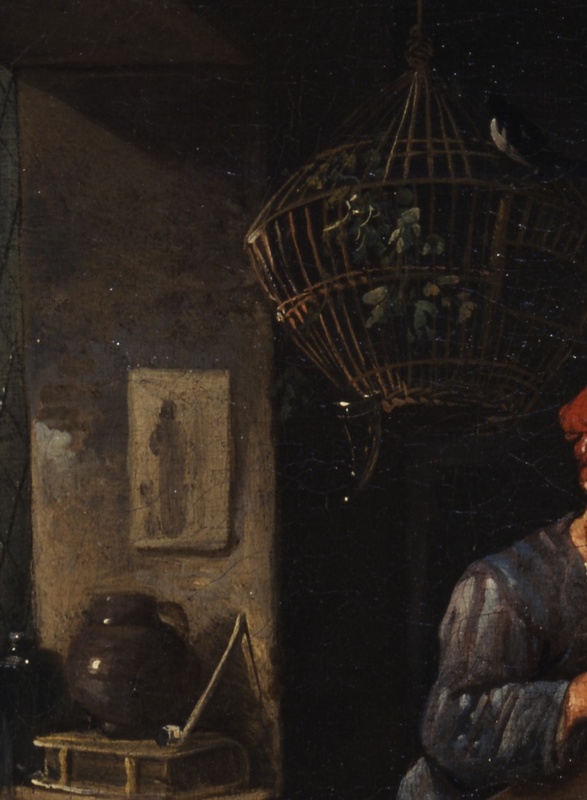 Note the birdcages in both this painting and the Thomas Wijck. 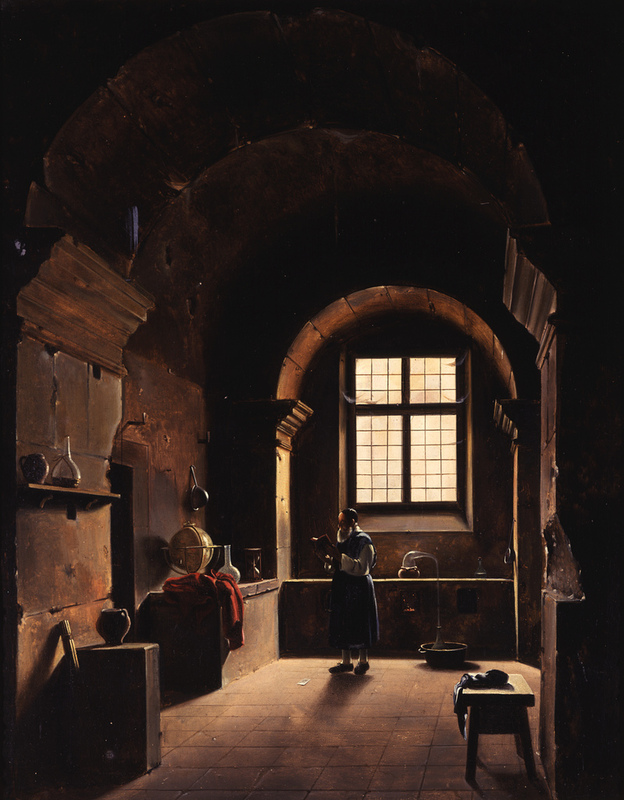 Interior of a Laboratory with an Alchemist. David Teniers II. Oil on canvas, 17th Century Eddleman Collection, CHF. Trouble Comes to the Alchemist. Dutch School, 17th-century. Oil on canvas mounted on board. 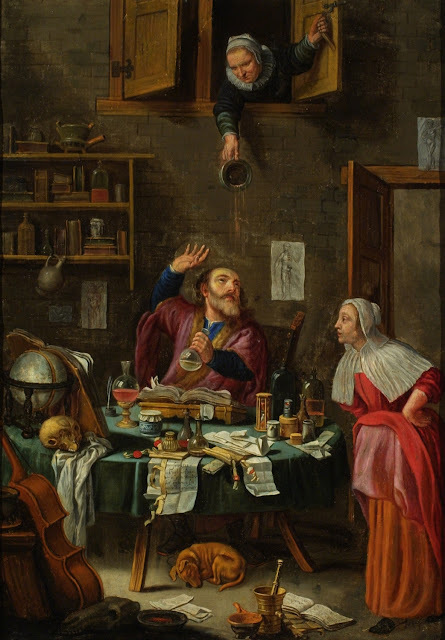 From the CHF: "Although the title suggests this is an image of an alchemist, the scene is one of a physician conducting a uroscopy for a female patient. The confusion may be due to the similarity in objects used in both relative practices. 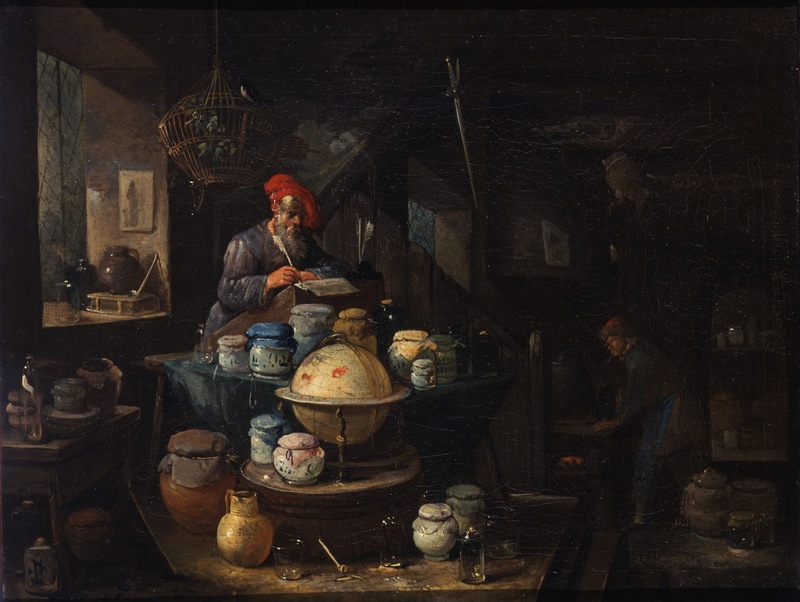 These include a mortar and pestle, a variety of flasks and containers, a human skull, an hourglass, a celestial globe, and books. The overt hilarity of the old woman deliberately emptying her piss pot on the physician's head would have been instantly appreciated by any contemporary viewer of this work. Musical motifs, such as the cello in this painting, were traditionally a symbol of love and warning about sexual promiscuity. The poem on the table, attributed to Socrates, implies that the furious woman above is like Xanthippe, the Greek philosopher's famously shrewish wife. It reads: I knew well woman, it's no wonder, it would rain, after this thunder." A pipe and birdcage, apparent mainstays of the alchemist's quarters. 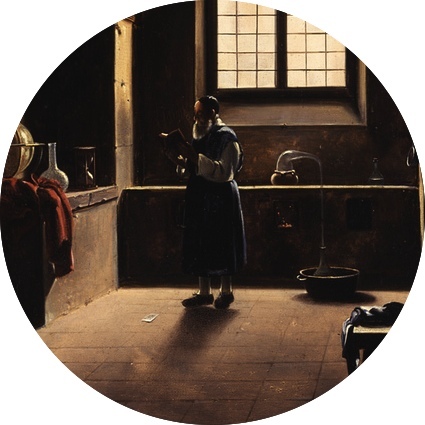 This is a painting of the Dutch Golden Age, so that blurry image in the background could potentially be a woodblock print from China or Japan. The detritus of a scholarly life. A surreal flourish in the Tenier painting: crocodilians were commonly hung in the shops of apothecaries and other early modern drug-makers. They represented the natural wonders of the tropics, or 'Indies,' from which many such drugs hailed. 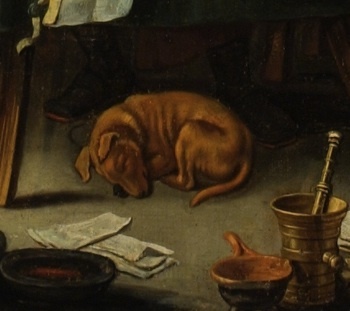 A sleeping dog, blissfully unaware of the pot of urine being poured on his master's head. Those interested in alchemy and the occult might want to start with the works of Frances Yates, the doyenne of early modern magic and alchemical studies, and go from there. Personally, though, I've always found Yates to be a bit too speculative. A personal favorite work on alchemy and the occult in the early modern era is Deborah Harkness' masterful John Dee's Conversations with Angels, which contains some great details about Dee's home life and his relationship with his wife. 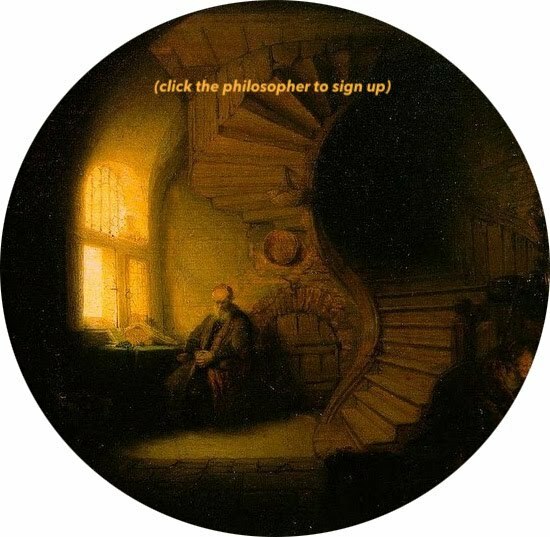 For readers with JSTOR access, Harkness' journal article "Managing an Experimental Household: the Dees of Mortlake and the Practice of Natural Philosophy" contains further insights. 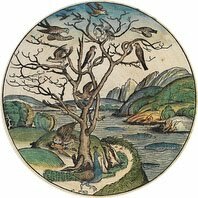 Finally, The Alchemy Website has been an internet mainstay for primary source texts and images relating to alchemy for many years. Have you read any of Lawrence Principe's work (a book on Robert Boyle as a quasi-alchemist, and one w/ Newman on George Starkey, an American alchemist who corresponded with Boyle? It's especially interesting because Principe is trained in both history of science & organic chemistry, so he has a scientist's perspective. But I don't know how his work has been received by other academic historians. I haven't read much of Principe's work but I'm familiar with his take on Boyle and I agree with it. I looked at some of Boyle's papers in the Royal Society last summer and it really is striking how many commonalities there are between him and other 17th c. alchemical writers that get left out of accounts of him as the 'father of Modern Chemistry' and the like. My (subjective) impression is that most historians of early modern science would agree with Principe's book, since it battles with what are sometimes called 'Whiggish' or teleological narratives of the rise of science. Thanks for the mention of his book with Newman, I hadn't been aware of it. Looks very interesting! 1) I think Harkness is coming out with/has come out with a historical novel, FYI. 2) LOVE the depiction of scholarly mess. Story of my life. Often a sleeping dog (fido) represents a lack of loyalty or fidelity. 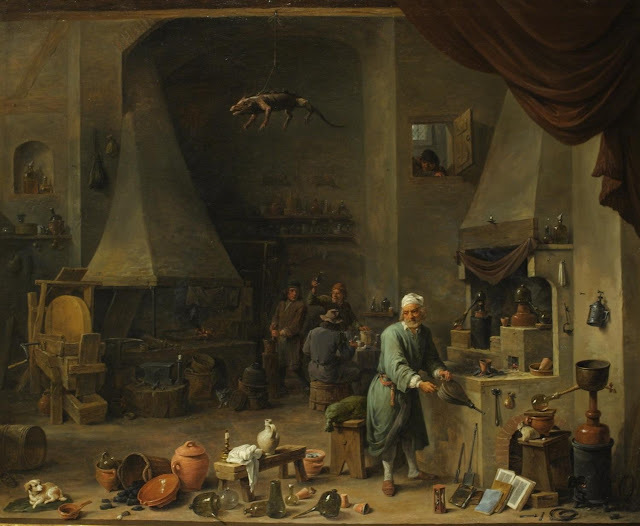 Alexander - Yes, that allegorical interpretation makes quite a lot of sense for the last painting ("Trouble Comes to the Alchemist"). I hadn't heard of that before. Thanks! My whole MA thesis topic was inspired by Harkness' book, in particular her research on Dee's marginalia of Dionysius. Although I eventually narrowed it down so as not to include analysis of Dee. This is a great blog I plan to revisit often. I love that picture with the dog.